This article is about a general type of computer file. For the specific file type used in some operating systems, see .exe. Executable files can be hand-coded in machine language, although it is far more convenient to develop software as source code in a high-level language that can be easily understood by humans. In some cases, source code might be specified in assembly language instead, which remains human-readable while being closely associated with machine code instructions. The high-level language is compiled into either an executable machine code file or a non-executable machine-code object file of some sort; the equivalent process on assembly language source code is called assembly. Several object files are linked to create the executable. Object files, executable or not, are typically in a container format, such as Executable and Linkable Format (ELF). 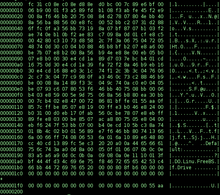 This structures the generated machine code, for example dividing it into sections such as the .text (executable code), .data (static variables), and .rodata (static constants). In order to be executed by the system (such as an operating system, firmware, or boot loader), an executable file must conform to the system's application binary interface (ABI). Most simply a file is executed by loading the file into memory and simply jumping to the start of the address space and executing from there, but in more complicated interfaces executable files have additional metadata, specifying a separate entry point. For example, in ELF, the entry point is specified in the header in the e_entry field, which specifies the (virtual) memory address at which to start execution. In the GCC (GNU Compiler Collection) this field is set by the linker based on the _start symbol. Executable files typically also include a runtime system, which implements runtime language features (such as task scheduling, exception handling, calling static constructors and destructors, etc.) and interactions with the operating system, notably passing arguments, environment, and returning an exit status, together with other startup and shutdown features such as releasing resources like file handles. For C, this is done by linking in the crt0 object, which contains the actual entry point and does setup and shutdown by calling the runtime library. Executable files thus normally contain significant additional machine code beyond that directly generated from the specific source code. In some cases it is desirable to omit this, for example for embedded systems development or simply to understand how compilation, linking, and loading work. In C this can be done by omitting the usual runtime, and instead explicitly specifying a linker script, which generates the entry point and handles startup and shutdown, such as calling main to start and returning exit status to kernel at end. ^ "executable". Merriam-Webster's Online Dictionary. Merriam-Webster. Retrieved 2008-07-19. ^ McKellar, Jessica (Mar 16, 2010). "Hello from a libc-free world! (Part 1)".